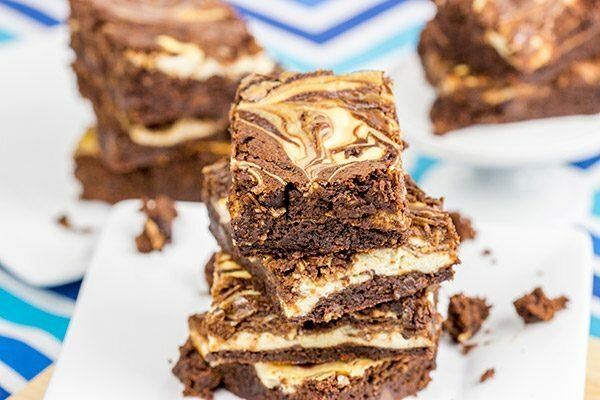 Why pick one when you can have Cheesecake Swirled Brownies? I love brownie edges. Seriously…I’ll fight you for the edges of the pan of brownies. And if it’s a corner piece? Watch out! (For the record, the same goes for the end piece of a loaf of sandwich bread or banana bread.) But here’s the thing. As much as I love those edge pieces, I don’t actually own one of those Edge Brownie Pans. Heck, I’ve got enough pans as it is…I don’t need one more specialty pan to store in the bottom of my pantry or on the top shelf in the basement. I am the proud owner of a cast iron pan that bakes cornbread (or whatever else) in the shape of little bears. I also have another one in the shape of little fish. (Because everyone needs multiple specialized cast iron pans, right?) I have every size cake pan imaginable. Need a 4″ deep lasagna pan with a removable bottom? I got ya covered. Need 4 different styles of bundt pans? I got ya covered. Need a brownie edge pan? Keep on looking because I can’t help ya there. Laura and I got to talking about some of the different cheesecakes I’ve made, and this Brownie Bite Cheesecake came to mind. It featured bits of brownies baked straight into the cheesecake. That’s when the thought hit me about switching it around. What would happen if I stuffed cheesecake into brownies? Well, I’ll tell you what happens. 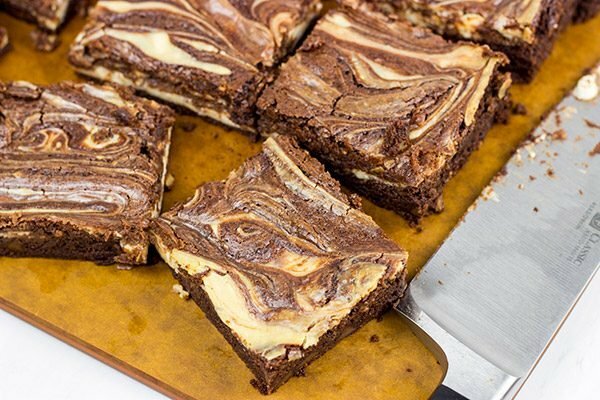 Cheesecake Swirled Brownies. It’s like 2 of your favorite desserts swirled, layered and generally stuffed together into one. How can you go wrong there? So when I pulled these Cheesecake Swirled Brownies out of the pan, I transferred the whole thing right onto a large cutting board. I then proceeded to trim off all of the edges…you know, to make each brownie nice and clean. Yeah, right. I proceeded to eat all of the trimmed-off edges right there in the kitchen. Call it a mid-afternoon snack. Call it an early dessert. Either way, I can’t be trusted around brownie edges. And when they’re Cheesecake Swirled Brownie edges? That’s a no-brainer! 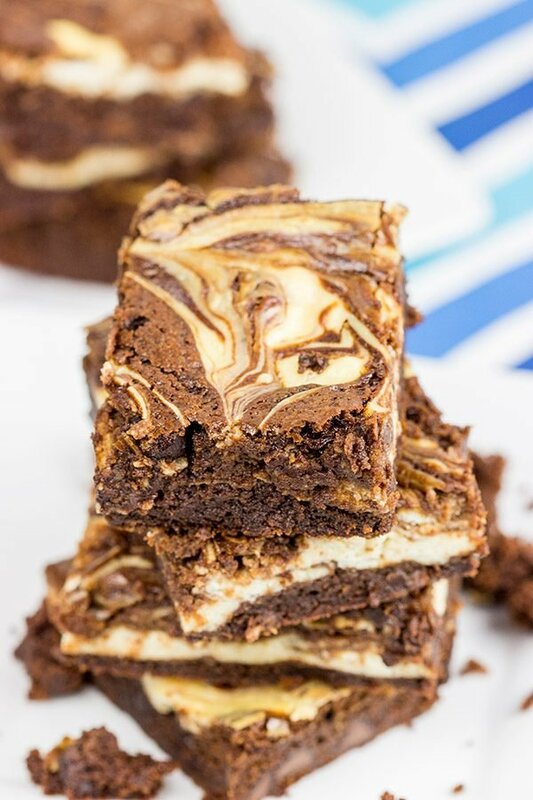 If you’re a fan of cheesecake and you’re a fan of brownies, then these Cheesecake Swirled Brownies need to show up for dessert in your house! They aren’t that difficult to make at all…but do me a favor and save me the edges, ok? Enjoy, friends! Line a 9”x13” baking pan with aluminum foil, allowing 2” of overhang on all sides. Set pan aside. Using a medium saucepan, add the butter, unsweetened chocolate and 1 cup of chocolate chips. Place over medium-low heat, stirring often, until butter and chocolate have fully melted; set pan aside to cool. In a large bowl, mix together the eggs, sugar and vanilla. Stir the egg mixture into the warm (not hot!) chocolate mixture. 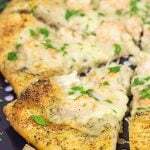 In a medium bowl, sift together the flour, baking powder and salt. Stir the flour mixture into the chocolate mixture. Remove 1 cup of brownie batter; set aside. Pour remaining batter into prepared baking pan. 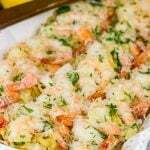 Spread cream cheese filling evenly over batter. Microwave reserved 1 cup of brownie batter for 15-20 seconds, or until pourable. Using a large spoon, drop dollops of the brownie batter on top of the cream cheese layer. 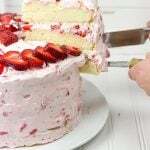 Using a knife, swirl batter into the cream cheese layer to create a marbled pattern. Bake at 325°F for 53-55 minutes, or until top of brownies is just set and a toothpick comes out mostly clean. Now I know why we’re friends–it’s so I can give you the brownie edges and keep the gooey center pieces for myself! For real, next time I make brownies I’ll just send you the corners because I never want them. 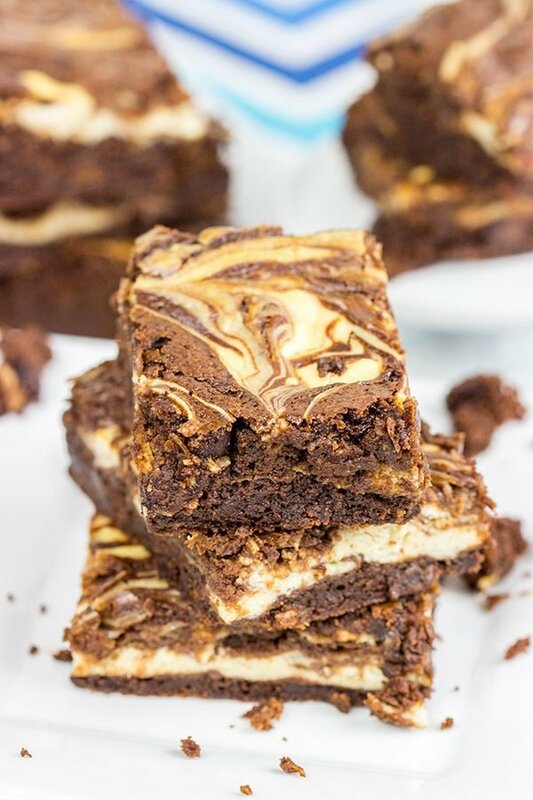 Although I might make an exception for a cheesecake brownie. . .these look SO FABULOUS! You know how much I love my cheesecakes :). Have a great weekend, David! Yes! We can be brownie buddies, Kelsie. I love the edge pieces…like I seriously ate every bit of the edges that I trimmed off of these brownies. And then I felt a little ashamed about it. Haha! I’ll take every single corner and edge piece that you are willing to part with, my friend! 🙂 And do try mixing some cheesecake into brownies…the result is amazing, and you don’t have to try and choose between 2 different desserts! Hi David! What a great combination dessert! 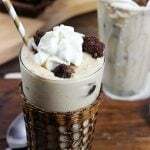 I just ate the last piece of your German chocolate brownies around 3:00 am this morning, so I think I’ll wait a little bit before I make these 🙂 But trust me I will be onto these before too long! In my house you’d have to share those edge pieces!! Here there, Dorothy! So I’m sad to hear that the German Chocolate Brownies are no more, but now you can put this recipe on your list of things to try next. And it really is a good one! We’ll have to play rock-paper-scissors for the edge pieces, though. Haha! Thanks so much, my friend. I hope y’all had a great weekend! Oh come on, Ben…you know I would never, ever give up on desserts! Truthfully, desserts (and bread) are my passion…but we can’t only eat desserts for a meal. Or can we? 🙂 So you can make the swirls in these brownies (or in this cheesecake?). I promise. I seriously just took a table knife and swirled it back and forth. And it worked! So save me all the edges, and we can keep being friends, ok? 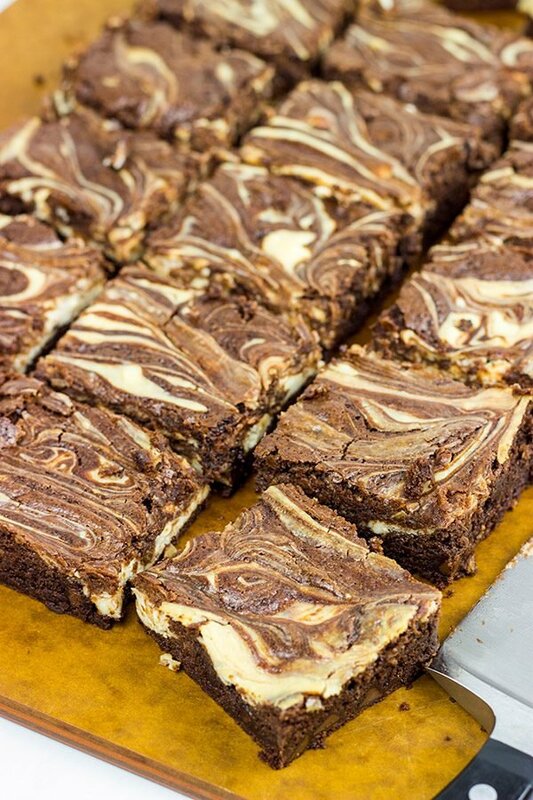 There’s nothing better than a brownie unless it’s a cheesecake swirled brownie! 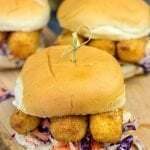 I think I can say Double YUM with these! They look so delicious! Why thank you so much, Kathy! I tend to agree with you here. I love brownies and cheesecake, so this one is perfect since I don’t have to choose between the two! 🙂 Thanks so much, my friend! edges are the best! if i’m bringing something to a party, i’ll cut off the corners (because DOUBLE edge! ), and save people from their ugliness (let’s be real, i’m just hoarding them for myself). Yes! The corners are the best parts of the brownie pan! I think this is why we’re friends, Heather. Now we just need to find someone else to be friends with who likes the middle pieces. Haha! You can have all of my brownie edges! I prefer the middle pieces. The cheesecake and the brownie combination is a great idea. I am so jealous of your collection David! I might sneak in your basement sometime :P. As for these brownies, they sound amazing! You have combined two of my favorite desserts together…I love them!! Hahaha! You are welcome to come over and raid my pan collection anytime you’d like, Deepika! The only cost is you have to leave me some of the deliciousness that you create using those pans. Deal? 🙂 Thanks so much, my friend! Cheesecake and brownies? Count me in. Hey there David, remember me? Long time no chat. It’s been forever since I had some time to look at my friend’s blogs and I’ve missed yours. So happy my afternoon turned out that I had spare time. I try to stay up to date with social postings, but it’s good to stop by the site now and again, right? Cheers! Hey there, Kevin! Long time, no talk, my friend! I’m glad to hear that life has slowed down a bit for you…at least for the weekend. Life is pretty crazy over here on this side of the country, too. We spend every second of free time chasing a certain toddler around the house…and yard…and stores…and, yeah you get it. 🙂 Thanks so much for stopping by! 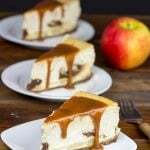 Am oiling up my drone as I write this… oooh… bloody heck… I just realized you published this post in October and chances are super slim that any of these brownie cheesecakes or cheesecake brownies adorn your kitchen counter! 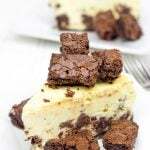 I love cheesecake and cheesecake in brownies is just swoonworthy!